On January 1st of the new year of 2014, the phone rang with the voice of my sister in law, who I hadn’t spoken with for several years. I could hear the terror in her voice, as she tried to control it while relating the events of the past few days that led to the minutes old diagnosis of bladder cancer. The shock felt by the family was deepened by the 1968 death of our father, 57 years old, of bladder cancer. He was ill for only 6 months, and in those days there was no hospice or anything like it, so our father died with only a few meaningful words spoken between us; he managed to pull us together to tell us to ‘take care of your mother’. My first instinct upon hearing this news was to A) drop all the dysfunctional family dramas B) call Dale. Not necessarily in that order. My brother, David (or Buddy as we called him) was open and eager to talk to Dale. He was aware of how important Dale’s work was to my friend, Margot who died of breast cancer the previous year and his connection to the saint Neem Karoli Baba who he knew about for many years. Dale was quickly available and was soon aware that David had many deep issues blocking the way of accepting what was happening to him. Additionally, David’s wife Jackie was in a state of trauma, conflicted about how to be with him in this new situation (which he didn’t make easy) and how to handle the caretaking on both physical and emotional levels. Dale had his hands full trying to balance both people without taking sides, and trying to create calm within a storm of anxiety, anger and panic. The first thing my brother said to me – in tears, was ‘ Dale is helping me open up my heart. ‘ This proved to be a very difficult process for him. If you’ve known him for a long time, you may know him as Buddy, his real middle name. Ridiculously cute with squinty eyes when he laughed and curly locks that the girls all envied, he grew up out of Buddy to a handsome man named David, who we love. As Edith Kitaen used to say, “˜I was just minding my own businessâ€¦” Then life suddenly takes a turn. No one wants to hear the diagnosis of bladder cancer, and David Buddy is courageously taking up the challenging battle. After several visits to the Novato Sutter emergency room for problems with the nephrostomy tube (allows the kidney to drain bypassing the bladder, now draining well) the doctors found a blood clot in his right leg. Acting swiftly, an ambulance took him from the Novato ER to UCSF at 2 am. For a week now, his team of brilliant and caring doctors have been carefully monitoring him while the blood thinners bring the blood to safe levels. Last week’s chemo was pushed out to this week, doctors determining it was just as effective to wait. Today is day 2 of the 2nd round of chemo, doing great, killing cancer cells! His medical team needs to constantly watch his blood levels, so it took up the day getting that done and was somewhat exhausting, but marching on! Throughout the chemo and stays at the rehabilitation home, David fought hard, both the cancer and anyone trying to help. Jackie had Dale’s wisdom and support to help her on a daily basis through this most terrible time. 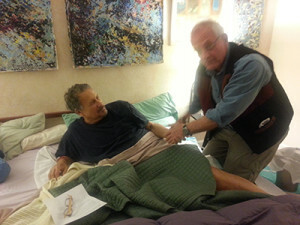 As for David’s needs, Dale did not give up for a second, offering him unconditional love with reminders of what is of importance, obvious in the included photo. On Monday, April 14th we all gathered at the home as news came that David was no longer able to swallow. Although a most difficult, gut wrenching time, David and his daughter, sisters, wife and friends were able to support each other with the help of hospice and Dale. After being comatose for 2 days with those he loved at his side, David suddenly leaned forward, opened his eyes wide as if in awe of what he was seeing, took a long breath, held it, took another long breath then seemed to be pulled away into somewhere else. After many minutes of very full silence, his daughter Lizzie said ” look, he’s smiling”. Peace, thankfully at last. Dale is still in touch with Jackie, helping her through the intense grieving process, for which she is very thankful.